What’ll be matey? Draw if you dare. Dead Man’s Draw is an incredible filler game for when you want something light. 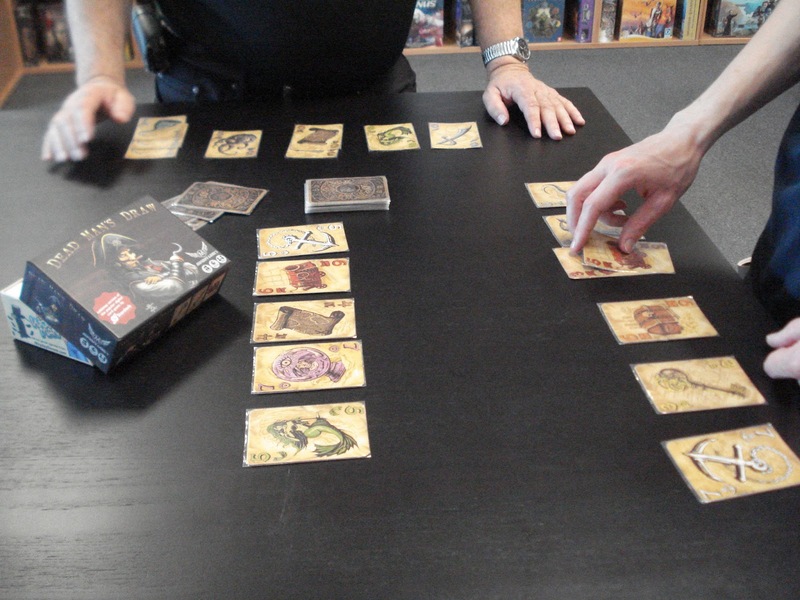 This press-your-luck pirate-themed game features a deck of loot cards and a deck of pirate trait cards. The loot cards are comprised of 10 different types – cannon, oracle, treasure map, anchor, chest, etc. with each type having a specific pirate like action. Additionally, each loot card indicates an end of game scoring point value. A Cannon’s action is to send a card from an opponent’s scoring area to the discard pile, whereas the Oracle lets you preview the next card on the loot deck. The pirate trait cards each enhance the ability to use one of the 10 types of loot. A Scavenger’s trait allows the player with that trait card to keep the cards stolen from an opponent with a cannon’s action instead of sending them to the discard pile. The object in a game of Dead Man’s Draw is to have the best stash of loot in your play area when the loot deck is exhausted. Each player begins the game with a pirate trait card. A player’s turn consists of turning over the top card of the loot deck, placing it face up in the play area and completing the action associated with that loot type. Next, the player decides whether to continue to draw again or not. The player can quit and take the face up cards placing them in their scoring area, or they can continue to draw more loot cards. Anytime a second card of the same loot type is drawn the player busts and depending on the type of loot in the play area all or most of the face up cards will go into discard pile. So beware of the Kraken as its action requires the player to draw and play 2 more cards many times causing a bust. When the loot deck is exhausted each player adds up the highest value of each loot type in their scoring area. Most points wins. 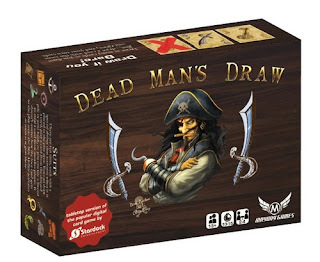 Dead Man’s Draw is 15 minutes of pirate fun in a small box ready for play at home, at the beach, or in the local coffee shop. We have an open copy of Dead Man’s Draw available in our Demo Games Library for you come in and try.